Articles on audio, sound, design. 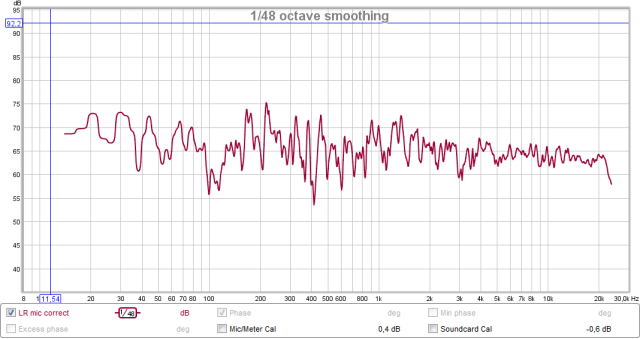 Learn how to set the center distance distance correctly to get the best sound. The center distance is a setting in the processor/AVR, affecting time delay of the center channel relative to the other speakers. The value is set by automatic calibration, or manually, to the physical distance from the listening position to the center channel speaker. 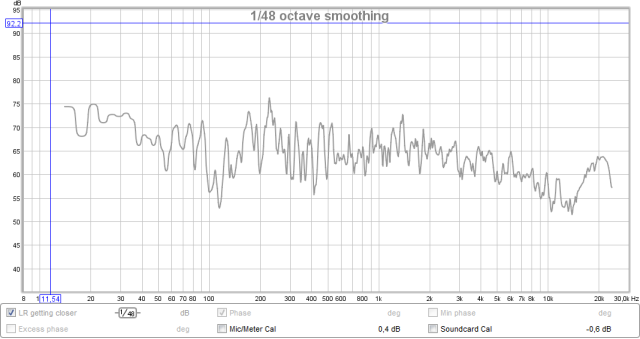 We will see how more accurate fine adjustment of this distance can improve sound quality and how to do it. The distance setting affects the timing of the signal to the center, and thus the summation of signals across the front stage. 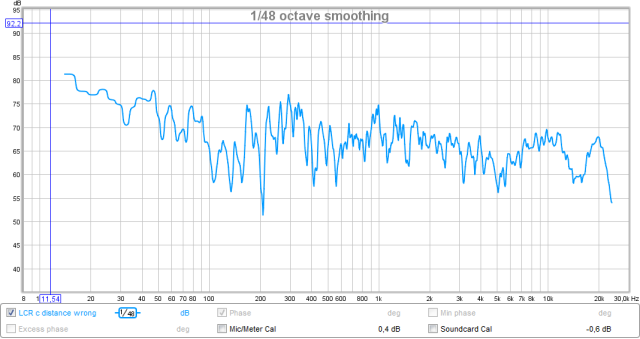 If the three L, C, R front speakers have different timing, the summed frequency response will not be correct. In particular sounds that are panned across the front will be affected. If the phase response from the center is different from the L R mains speakers, it will not be possible to get a smooth total response. The concept of "timber matched" speakers is quite misunderstood, as it is not the typical small differences in frequency response amplitude that causes problems, but differences in phase response and off-axis radiation. The center speaker must have a phase response and radiation pattern similar to the L R speakers to be able to provide seamless front stage sound. If the distance is far off, more than 20cm, the low frequency response will be affected. Smaller errors down to around 2cm is perceived as loss of focus and clarity at higher frequencies, for signals spread out on all front speakers. For movie dialogue recorded only in the center channel there is no difference, even for large deviations. So, for those hoping this is a way to move the center sound image further away from the listening position, to make it more similar to using a phantom center, unfortunately that does not work. We can use a correlated pink noise signal played through all front channels and monitor the frequency response to see if the channels sum correctly. Wrong timing will show up as comb filtering, visible as dips in the response. Start up your functional REW or similar acoustic measurement set-up, and open the RTA real-time analyzer. You can create your own correlated noise signals by first making one channel pink noise, then copy this signal to the other channels. 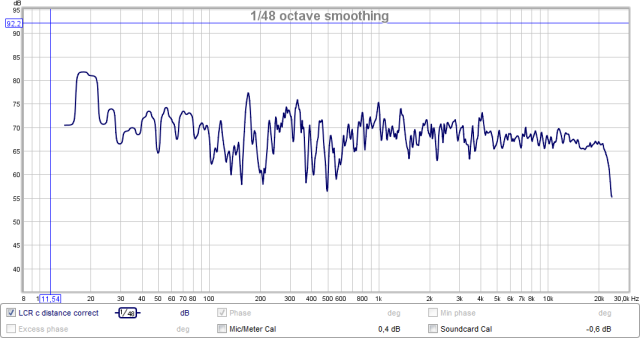 Frequency response graphs shown are from RTA with settings for quick and reasonably correct presentation of the situation above around 1KHz, at low frequencies the graphs are not accurate. First, we must align the microphone exactly between the front L and R at the listening position. Do this by playing a correlated pink noise signal in L and R, and move the microphone sideways until the response is most flat at high frequencies. Set the center channel distance to a reasonably correct value, within say 20 to 50cm. Also check that the center channel level matches the front L and R, and adjust if necessary. Then play a correlated pink noise signal in all L, C, R channels, and adjust the center channel distance in small 1cm increments until the response is as flat as possible. It may show a slight roll-off at higher frequencies, as even small differences in phase response between center and L, R will have significance. 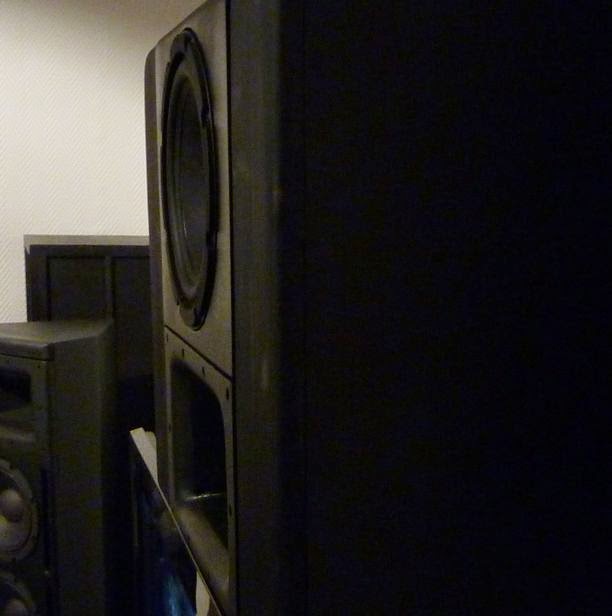 At low frequencies the integration to the subwoofer system is affected, and this is solved by adjusting the distance for the subwoofer system. 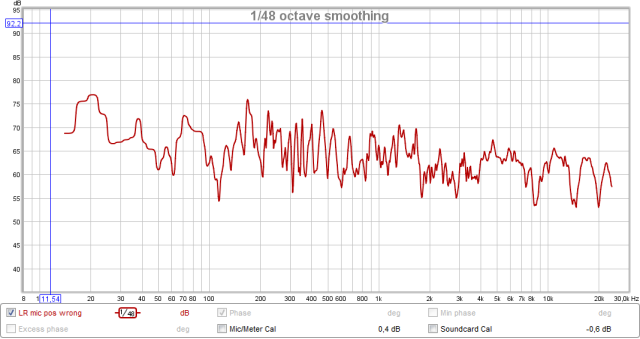 Subwoofer distance adjustment will be covered in a coming article.